Bella and Edward. Buffy and Angel. Buffy and Spike. Sookie and Bill. Sookie and Eric. Elena and Stefan. Elena and Damon. It seems you can’t crack a book, flip on the TV, or walk down a dark alley these days without finding a human girl and a vampire boy making googly eyes at each other. It’s no secret that the recent vampire craze is driven, in large part, by a female fan base. The final installment of the Twilight film series drew a 79% female audience (and that’s not even considering how many male viewers only went at the behest of their wives and girlfriends). Similarly, female viewers of the Vampire Diaries outnumber male ones by about a two-to-one. Not coincidentally, the past 20 years of vampire stories have sharply moved away from the vampire as repulsive villain and toward the vampire as romantic hero. 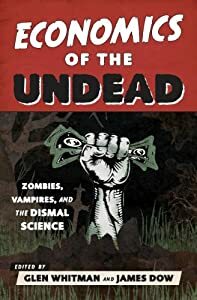 In editing Economics of the Undead, I realized that our book needed something to offer this particular audience. And I knew what exactly it should be: relationship advice. Surprising as it may sound, economics actually has quite a lot to say about romantic partnerships, starting with Gary Becker’s famous 1973 article on marriage markets. Moreover, bringing economics to bear on cross-the-grave romance allowed me to explore some concepts neglected by the rest of the book. The relevant models aren’t ones you learn in your typical Econ 101 course — I personally didn’t learn about them until grad school — yet they are significant enough to have nabbed their creators Nobel prizes in Economics in both 2010 and 2011. Finding a romantic partner isn’t like going to the grocery store and picking out one of a hundred identical bags of rice. Vampire boys differ from each other in age, beauty, wealth, psychotic tendencies, and so on. Human girls differ substantially as well. The quality of the mate matters, to both sides. To complicate matters further, not every couple is a “good fit”; we all know perfectly nice couples who just don’t belong together, however much they try. So the quality of the match matters as well. In markets like these, you must engage in a search over time. With each potential partner you meet, you must decide whether to settle down or keep searching. For human girls seeking vampire boys, the cost of search can be quite high, as you may have to visit unpleasant places like cemeteries, dark alleyways, and <shudder> local high schools. And the longer it takes to settle down, the more time you have to spend by your lonesome self. So you don’t want to keep search indefinitely looking for your one-and-only soulless mate. But how do you know when to stop searching? Economic theory has the answer. A general result of search-matching models is that your best strategy is to decide upon a “reservation level.” In a job search, for instance, you would calculate a reservation wage; you would accept any wage offer meeting or exceeding it, and refuse any offer below it. In the mating context, you would decide upon your “reservation level of romantic satisfaction.” You would then accept any vampire who met or exceeded that level of satisfaction, and reject anyone else. A variety of factors should affect your optimal reservation level, including the number of vampires in your area, how many other human girls are in the market, how patient you are, and how content you are living by yourself… but if you want to know more, you’ll need to read the chapter. When you’re looking for a new mate, you’re shopping on a competitive market: you have many options, as do your potential partners. But as soon as you settle down, something changes. You start to make investments in your relationship — and, hopefully, so does he. You gain knowledge of each other’s tastes and quirks, like how you love sparkly clean fangs and he prefers type A blood. You develop routines that allow you to coordinate your schedules, which can be particularly hard when one of you sleeps in the daytime. And you create memories that are special just to you, like that time you faced down an army of bigoted anti-human vampires side by side. If you move in together, your new home will require a substantial investment in packing, decorating, coffin installation, and so on. Children, too, are an investment you make together. (There is some doubt as to whether human-vampire offspring are possible, but I take Twilight: Breaking Dawn—Part 2 as the definitive statement on the matter.) If you ever broke up, some of these assets that you’ve created together would become worthless, and others would lose much of their value. If you want to keep them as they are, you’re locked into bargaining with just one person. The situation is no longer competitive—it’s a monopoly. And because the same problem affects both partners, it’s a bilateral monopoly. This shift from competition to bilateral monopoly, which Williamson dubbed the Fundamental Transformation, affects business situations as well. Take, for instance, the casting of the Twilight movie series. Before the first movie was made, the producers were buying on a competitive market, since many young actors and actresses would have been happy to take the roles of Edward and Bella. But after Robert Pattinson and Kristen Stewart took those roles, something changed. For the subsequent movies, the producers had to negotiate exclusively with the actors they’d already chosen, as any threat of substituting different actors would surely have angered the fan base and threatened sales. As a result, the actors (both lead and supporting) were in a position to play hardball for better pay — which they did. The Twilight casting story demonstrates Williamson’s most important insight about the Fundamental Transformation: that it opens a wider range for bargaining over the terms of the agreement. On a competitive market, it’s much easier for either party to refuse the deal. But after some time has passed, it gets a lot harder to walk away. For that reason, one or both members of the partnership may try to change the terms of the relationship after the fact, just as the Twilight cast members did. This phenomenon is known as post-contractual opportunism. For instance, what happens when that cute vampire boy who seemed to be vegetarian suddenly “relapses,” succumbing to his bloodlust and feeding on innocent victims (a scenario played out in both Buffy the Vampire Slayer and the Vampire Diaries)? If he had behaved that way when they first met, the human girl would surely have spurned his advances. But in the context of an ongoing relationship, the human girl feels obligated to help him through the rough patch, rather than dumping him and losing everything they’ve built together. Students of economics might wonder if a version of the sunk-cost fallacy is at work here. Aren’t rational people supposed to ignore costs they’ve already incurred and can’t get back? But that’s simplistic Econ 101 thinking. Yes, it’s true that unrecoverable costs should be ignored. However, what those costs have bought you — the relationship-specific assets of your partnership — continue to be relevant. For that reason, it can be perfectly rational for people to tolerate behavior within a relationship that would have been sufficient reason to reject a new partner out of hand. And yet, as we know, relationships can, should, and do end – as we have seen in the case of Buffy and Angel, Sookie and Bill, and other cross-the-grave romances. So how do you know when to put a stake in it? Here, too, economics offers some answers, but once again I’ll leave those for readers of the book. You might be asking yourself at this point whether I’m being serious. And the answer is… sort of. Obviously, the vampire part of the discussion above is fictional, and much of the presentation is tongue-in-cheek But the application of search-matching and organizational economics to romance? No, I’m not joking. I’m not saying you need slide rules and spreadsheets to optimize your love life, but I do think the conceptual apparatus here is fundamentally right. It’s just true that finding a life partner is a search, with all the characteristics (costliness, randomness, etc.) specified in the search-matching model. And the recommended strategy is also correct: you have to decide what “bar” a potential partner must clear in order for you to settle down. As advice columnist and non-economist Dan Savage puts it, it’s silly to demand a partner who’s perfect in every respect; you have to find someone who’s good enough and then “round them up to the One.” Similarly, it’s just true that committing to a romantic partnership changes things in ways that create incentives to stay together, even when problems arise (as they inevitably will), and that’s what makes many stay-together-or-break-up decisions so difficult. In this case, as in many others, the economic way of thinking is vindicated. And that is the larger lesson of Economics of the Undead: the context may be fanciful or dead serious, but the principles of economics still apply. This entry was posted on Sunday, July 27th, 2014 at 8:28 pm	and posted in Uncategorized. You can follow any responses to this entry through the RSS 2.0 feed.